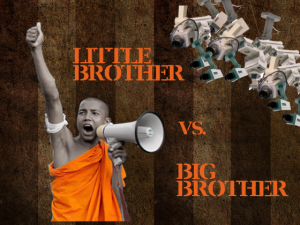 Huge thanks to the 58 backers who helped us reach and exceed our goal for our Little Brother vs. Big Brother campaign. Thanks to their support, we’ll be translating Cory Doctorow’s Little Brother into four Burmese languages. We used Kickstarter to run the campaign and we’re extremely happy with the results. Kickstarter is a funding platform that includes rewards for people who back the project, a way to send frequent updates, and an all-or-nothing deadline that encourages people to contribute in order to guarantee a project’s success. We are so grateful to our backers! Thanks for making the project a success. Sam Gregory, Charles Lenchner, Heather, Jason Kende, Chrysm Watson Ross, Pete Young, Yancey Strickler, Cristina Moon, Enigma Images, Liz Wall, Martha Jackson, Frank G, Matthew Murphy, Kyle B. Doeden, Jaroslav Valuch, Lara Shortridge, Eunah Choi, David Manheim, Mary Robinette and Patricia Chou. Noel Hidalgo, Sarah Ann Ran, Martin Sutherland, Scott Andrews, Gregg Butensky, Timo Rossi, Ashley Mui and Elizabeth Stucki. Joe Beshenkovsky, Christine Martin, Alex Shepard, Robert Soden, Carl Rigney, Dietrich Ayala, Patrick Nielsen Hayden, Julia Posteraro, Allan Beatty and Kevin Riggle. Jonathan Berger, Ben Babcock, David Cross, Stefan Jones, Brad Weikel, Eric Cooper, the publisher Tor Books and the book’s author, Cory Doctorow.